Speaking of speaking, I realized that I’ve been woefully behind in blogging speaking engagements the last few months. The second talk was at UrHo Talks 2, which was a great event at Mike and Willow’s that featured fascinating speakers on a wide variety of topics from the financial mess to the ownership of Mars to Craigslist pranks. 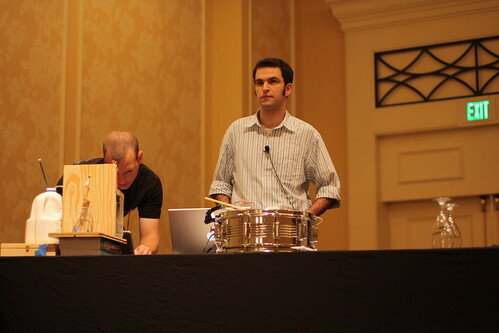 I gave a less technical version of my RubyConf RAD talk and also premiered the solenoid version of my drumming robot. The last talk was at the new Stepchange Group offices. I’ve been doing some work of the Stepchange the last few months and they recently moved into a fancy new office in NW Portland, which they decided to christen by having a Beer and Bots event. 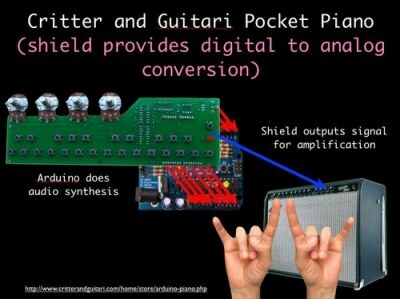 This version of the talk was again very similar to what I gave at UrHo Talks, but I added an additional demo showing off my new Critter and Guitari Pocket Piano. A bunch of old Dorkbot PDX hands came out to this one and they did a great job heckling me and making sure I didn’t let any pesky details slide (which my Stepchange co-workers quite enjoyed). I’m looking forward to giving more talks on RAD this year and to switching up the content a little more as I develop new demos and figure out new ways to explain the subject and to get people excited about it.